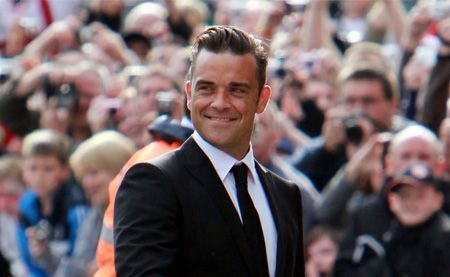 ROBBIE Williams worries about Justin Bieber and thinks it is 'inevitable' he will hit a rough patch at some stage because of his huge fame and success. The 39-year-old singer is concerned the 18-year-old Canadian star is too young to deal with his huge success and fame. The Take That star, who battled drug abuse and severe depression in the past, told The Sun newspaper: "There is a list longer than my arm of f***-ups. It's inevitable that someone like Justin Bieber will hit a hard time." Robbie previously admitted he is constantly worried his insecurities will get the better of him and lead him to ruin his life. The singer, who spent several stints in rehab to combat drug and alcohol addiction, and his wife Ayda Field welcomed their first child into the world, daughter Theodora 'Teddy' Rose last September and he credits his family with keeping him on track. But he previously admitted there is a part of him that will always be "mad for" dangerous narcotics and he'll never get over his urges completely. "Everything I like is addictive, destructive, or corrosive. Addiction to danger is no stranger to me, it's fashion. "There's always going to be a part of me that wants to exist in a psychedelic realm. I only did heroin once and never got addicted but there is still a lot of me that is mad for all that." Is Justin Bieber dating Ella-Paige Roberts-Clarke?